This was a time consuming stage to do, with lots of sampling but it was also fun as I tried a few larger samples that I was pleased with. 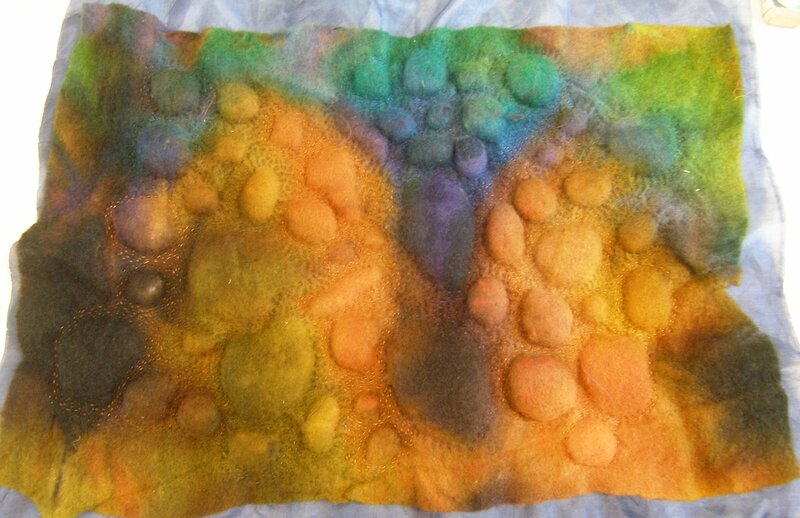 For the basic samples I used plain calico to show the effect of the fabric manipulation. 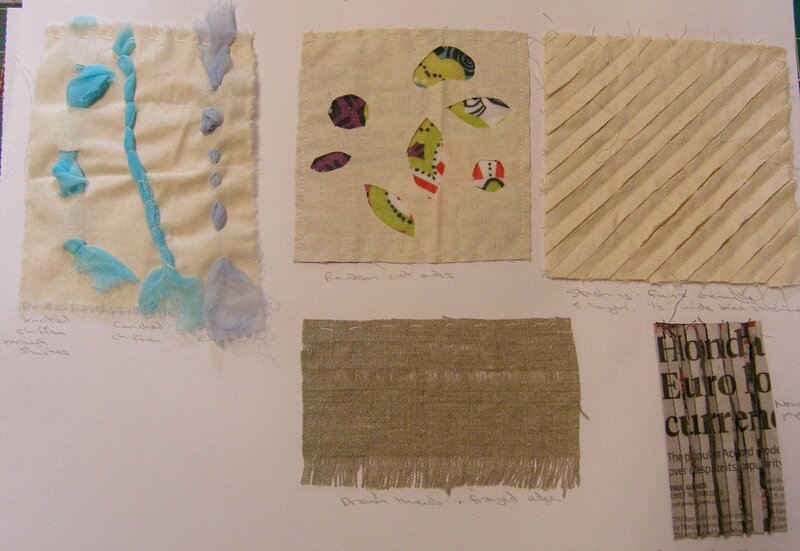 I used the recommended reading text The Art of Manipulating Fabric by Colette Wolff as my source for ideas for each section. The course book said to try as many of the different types of manipulation as possible so I did samples for all of them. After pleating the calico samples I wanted to try a piece with a definite geometric pattern to see how the pleating impacts the design. 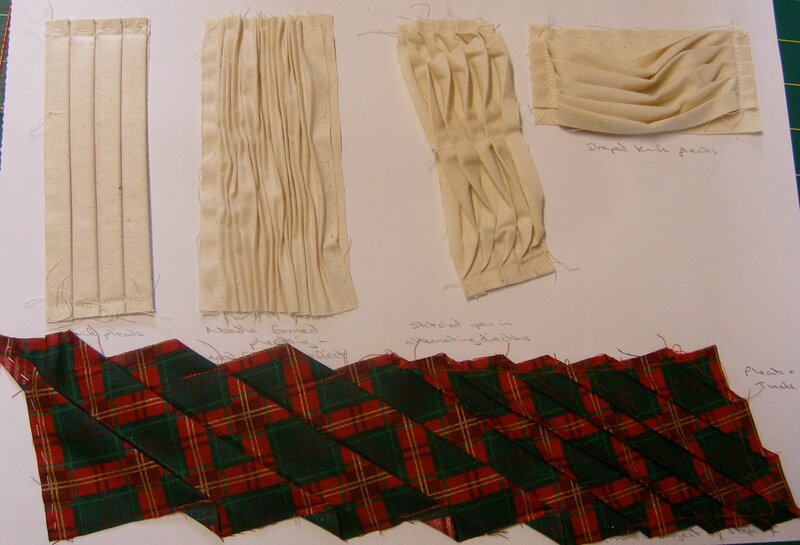 The tartan strip has pleats at one end and tucks at the other. The distortion of the pattern is effective as the strong horizontal and vertical lines are broken but still visible. The slashing technique here is one of my favorites particularly when used on the newspaper which could be distressed even more to distort the wording. My free motion quilting needs more practice! I had problems with getting the stitches even but I did have fun doing general squiggles and then trying to form more defined shapes. 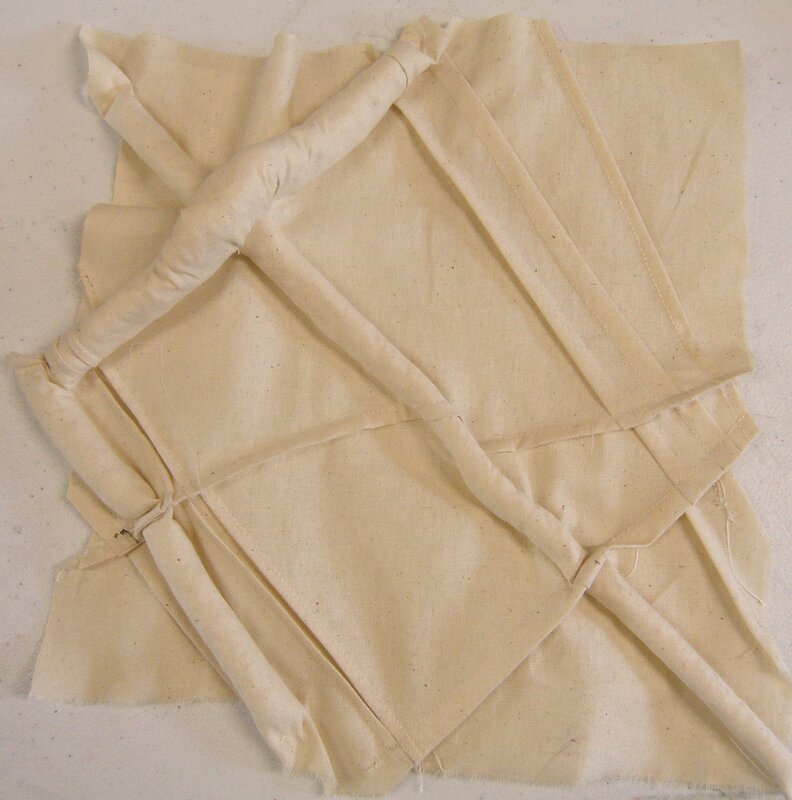 I used Stiffy fabric stiffener for moulding and also tested a small sample of Wireform that I sandwiched between 2 pieces of calico and then free motion stitched over. The Stiffy has a disadvantage of deteriorating in humid conditions but the Wireform would be great to use for vessels. I used a mix of tucks and raised shapes for this sample. 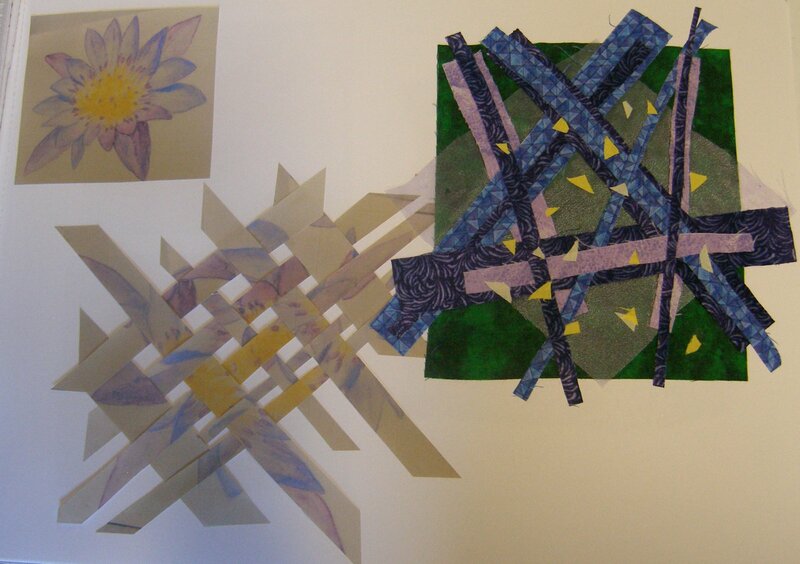 Although I got the variation in techniques and directions which did pick up on the waterlily work I am disappointed with the overall effect and do not feel that this piece stands on its own as a piece of work. The stuffed areas particularly do not work well and the layering effect I was trying to achieve is not present. Due to my disappointment with this sample I decided to do larger samples of some of the other techniques, this time using colour to see what I could achieve. As I like the effect of the slashing, I made the following sample. The top and base layers are cut from pieces of nuno felt that I made some years back, I sandwiched purple silk between these layers. 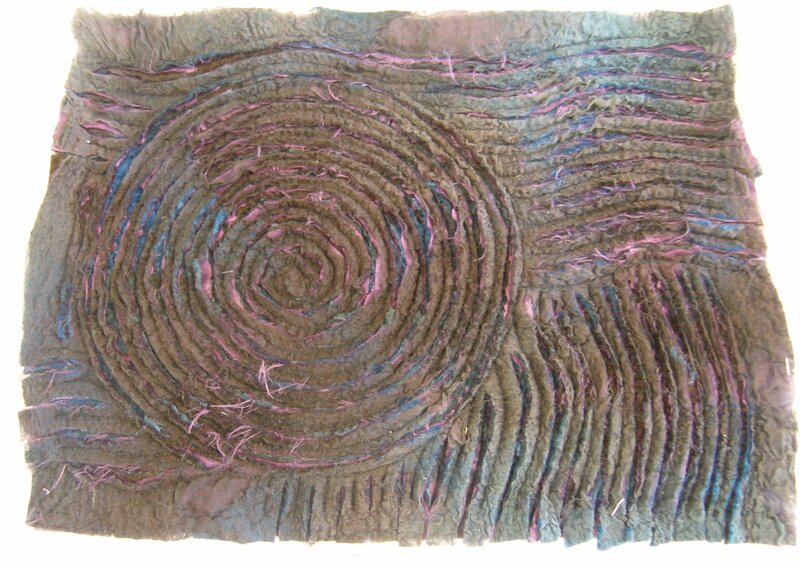 As can be seen I stitched a large spiral and then wavy lines in different directions. After cutting the nuno felt fluffed up well on the surface and the different colours of the felt and silk work well together. Next I revisited the raised shapes samples and did this larger one with pebble type shapes. It is made from dyed pre-felt. 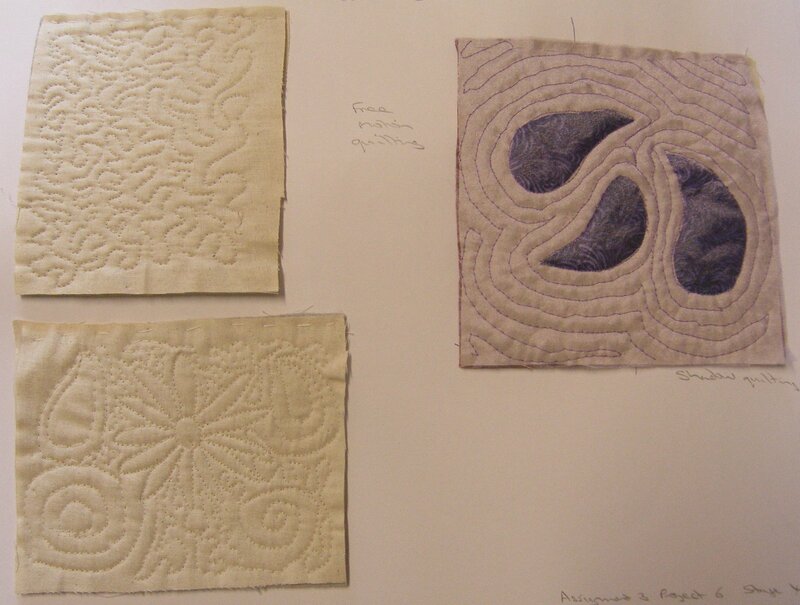 I used running stitch to create circles and ovals in different colours of thread to match the pre-felt. 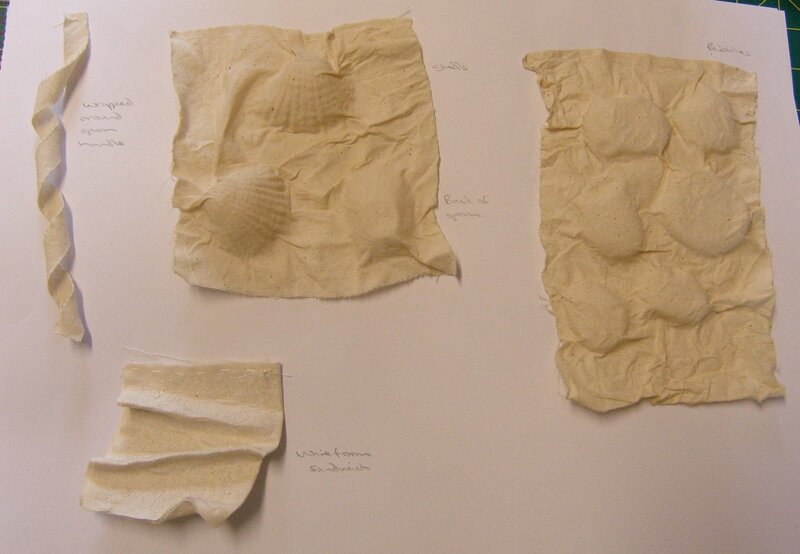 These were cut open from the back, stuffed and stitched closed. 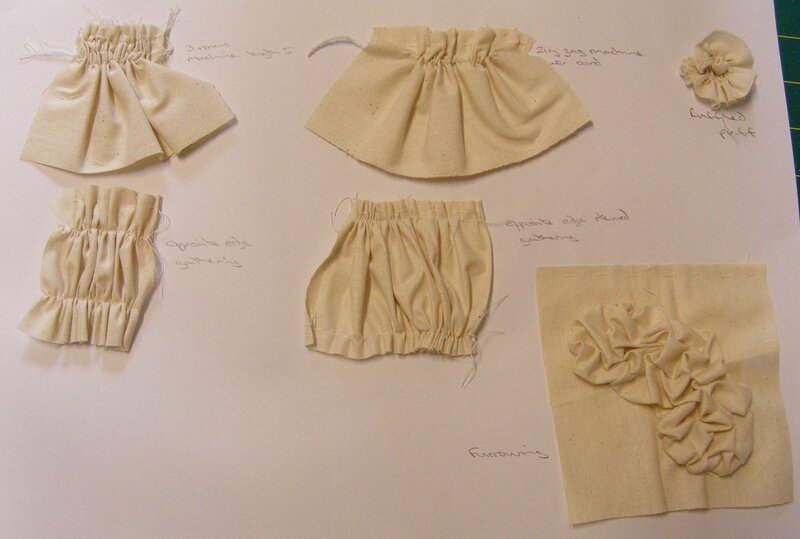 The spaces between each shape were also filled with stitching to really emphasise the flat and raised elements. This worked really well to create a good 3-dimensional look. Finally I decided to combine a few techniques in one piece. I used a flower photo that I took in Singapore and used Transfer Artist Paper to print this onto white cotton (A4 size). 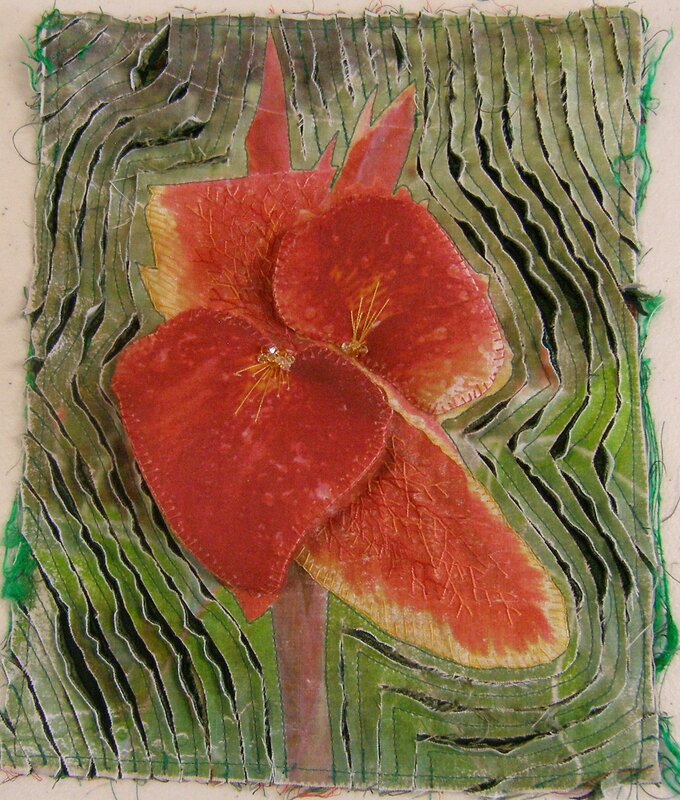 I layered green fabrics underneath and used the stitch and slash method on the green background areas. 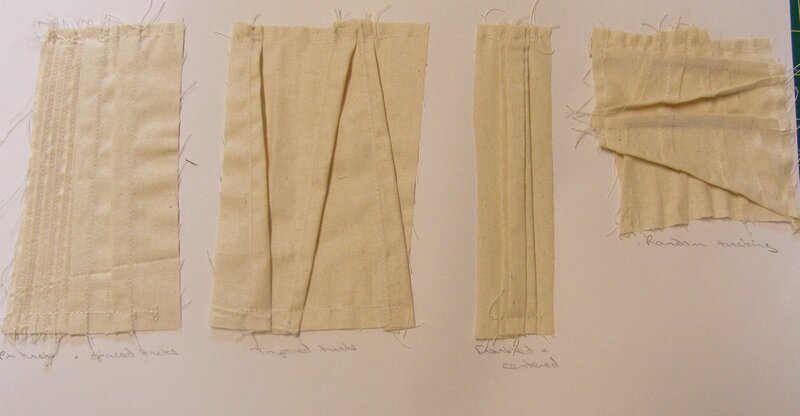 Then I washed this to improved the handle of the fabric, soften the colour and fray up the slashed edges. The next step was to do buttonhole stitch around two of the petals in yellow thread to empahsise the shapes. I filled in the centre of these with layers of fly stitch in variegated red and orange silk thread. I did a second TAP image, used Bondaweb to attached a backing fabric and cut out two petals. I stitched with yellow thread and added a few crystals just to emphasise the central colour of each petal. These floating petals were attached in the centre and at just a couple of places on the edge of each petal so they remained raised. I feel this piece works well because of the contrast between the background and central image in colour and it’s treatment. The raised petals provide contrast in depth of colour, smoothness in comparison to the stitched petals and the background and they lift the flower off the background. I was really pleased with the coloured larger samples I did, I felt that they were successful and have provided me with more ideas that I could use in future projects.